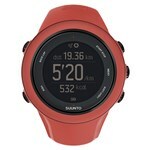 Suunto Ambit3 Sport New - Cora.. It track and analyze your performance to progress. You can connect your watch wirelessly to your iPhone/iPad. It visually enrich, relive and share your experience to make every move count. The Suunto Ambit software can be upgraded through Movescount.com so you can get all the latest features and performance enhancements. The Ambit 3 Sport is housed in a robust casing and has an enhanced battery lifetime of up to 25 hours in GPS mode. Ambit 3 Sport Features: Outdoor Functions: Full-featured GPS, GPS recording rate (1 s, 5 s, 60 s), Waypoint and visual route navigation, Find back, Track back, Track logging, viewing and sharing, 100 Point of Interest (POI), Route planning, GPS altitude, Altitude graph, Total ascent/descent, Vertical speed, Altitude difference, Log recording rate, 1 m Resolution Training/Sports Features: Integrated GPS speed and distance, GPS track recording, Distance based autolaps, Log recording rate (1 s, 10 s), RR interval, Heart rate in beats per minute, Heart rate in of max hr, Real-time, average and max. heart rate, Calories & Heart rate limits, Heart rate graph in real time, Peak Training Effect & Recovery Time, Log recording rate, Real time EPOC, Recovery Time, Laps, Autopause, Chrono & Interval timer, Autoscrolling of exercise displays, Memory left indicator, Speed and heart rate-based guidance during exercise, Personalized workout guidance, Fitness test, Training plans downloadable from Movescount, Adaptive training plan in watch, Log summary on the watch with lap details, Customizeable sport modes and displays, Activity based recovery time, Training analysis, Training logbook with story and image support, GPS track analysis, Heart rate zones & EPOC & V02 max values, Change sport mode during exercise, Preconfigured multisport modes, Multisport exercise summary, Post-analysis of multisport exercise by sport, Running pace & Suunto FusedSpeed™, Average pace in real time, Running cadence, Average stride length & Running efficiency, Ghost Runner (Suunto App), Lap comparisons by kilometer/mile, Marathon End-time Estimator, Cycling speed, Average speed in real time, Multiple Bike POD support (Suunto ANT/ANT ), Hill incline in real time, Bike Power (W), average and maximum (with power sensor), Bike Power with power sensor (3s, 10s, 30s), Bike Lap and Lap Maximum Power, Power distribution & graphs, Peak Power Curve for peak power outputs, Normalized Power & Aerodynamic drag in real time, Pool swim pace and distance, Openwater swim pace and distance, Swimming time by pool length, lap, total, Swimming stroke rate, count and type, Swim styles detection with personal style teaching, Stroke efficiency & Automatic intervals, Dynamic lap table with strokes, pace and durations, Records heart rate in swimming with Suunto Smart Sensor General Functions: Time, date, alarm, dual time, GPS timekeeping, Countdown & Stopwatch timer, Firmware upgr"